McGregor: I'll Toy With Mayweather After I Knock Him Down! LAS VEGAS – Now Conor McGregor is promising punishment. The polarizing UFC superstar continued to state Tuesday that he’ll knock out Floyd Mayweather Jr. within two rounds when they meet Saturday night in a 12-round, 154-pound boxing match. This time, though, McGregor guaranteed that he’ll “toy with” the boxing legend after hurting him and will make Mayweather “beg me” to follow boxing’s rules. UFC president Dana White has repeatedly reminded media and fans that McGregor would pay hefty financial penalties and subject himself to a lawsuit if he does anything to Mayweather outside of boxing’s rules when the mixed martial artist makes his boxing debut at T-Mobile Arena in Las Vegas. Resorting to MMA moves won’t be necessary, according to McGregor (21-3, 18 KOs in MMA). 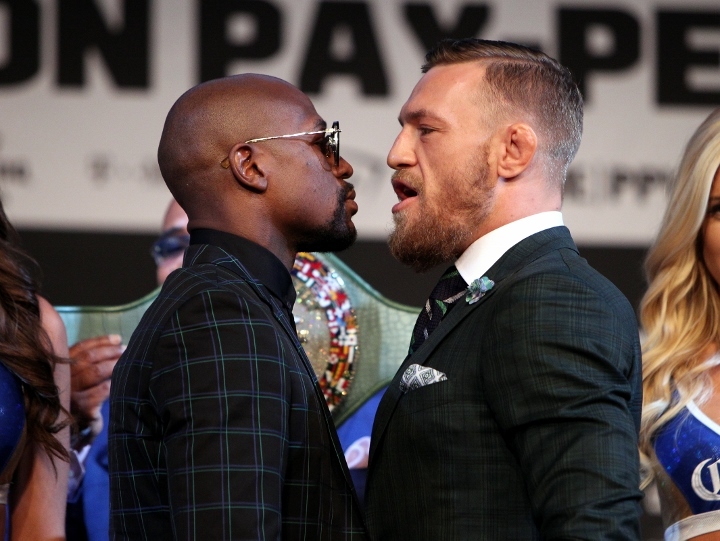 “I believe I’ll knock him out early,” McGregor told a small group of reporters Tuesday after he and Mayweather made their ceremonial grand arrivals outside of T-Mobile Arena. “[In] eight-ounce gloves, I don’t see him surviving. I don’t care if he catches it on the glove, either. I’ll flatten him through the glove. The powerful southpaw later added that he’ll hurt Mayweather (49-0, 26 KOs) to the point Mayweather will request for mercy as their fight progresses. [QUOTE=eco1;17976748]well, enjoy that Circus. It is your right and your money and besides, at least you will spend some time with friends! Take care! [/QUOTE] You are right .......no answer to that....a circus it is .